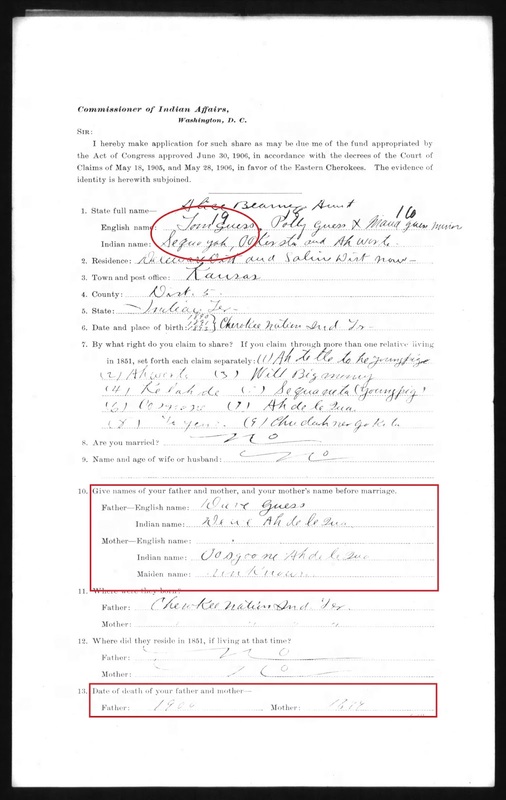 Sequoyah Guess was about 10 years old when his father died in 1900. His father's death left him an orphan because his mother died the previous year. He was too young to enroll himself on Dawes, but that didn't mean he wasn't enrolled. 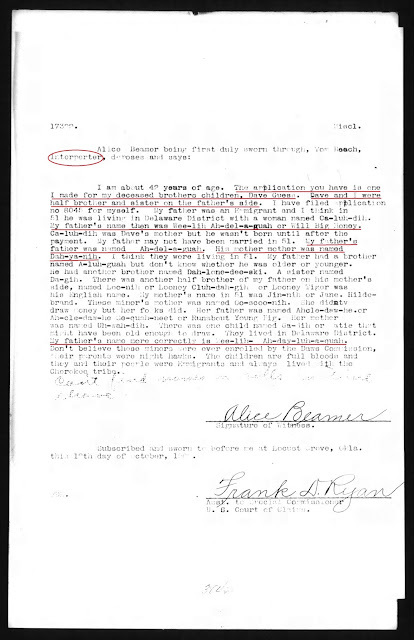 As was common for those who couldn't or wouldn't enroll themselves, an informant who knew the family gave their information. 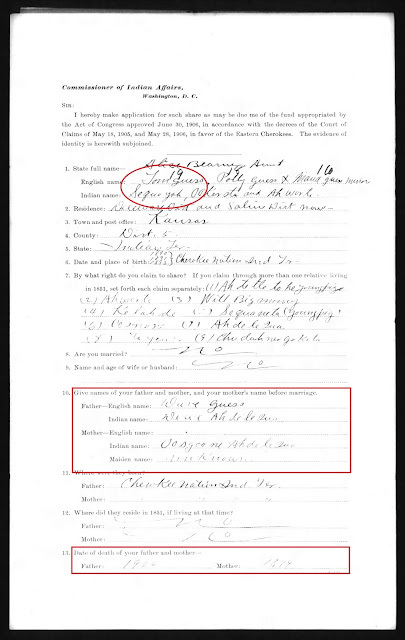 Per the testimony of Tom Smith in Dawes Packet 8338, Sequoyah was the son of Dave and Nancy (Ooskoony Young Pig) Guess. 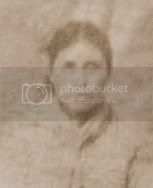 The accuracy of that testimony was validated by information found on the rolls taken in the Cherokee Nation during the years 1890, 1893, and 1896, where Sequoyah is listed with David/Dave and Nancy Guess. After a reasonably exhaustive search, it was not difficult to conclude that David and Nancy Guess were the parents of Sequoyah. 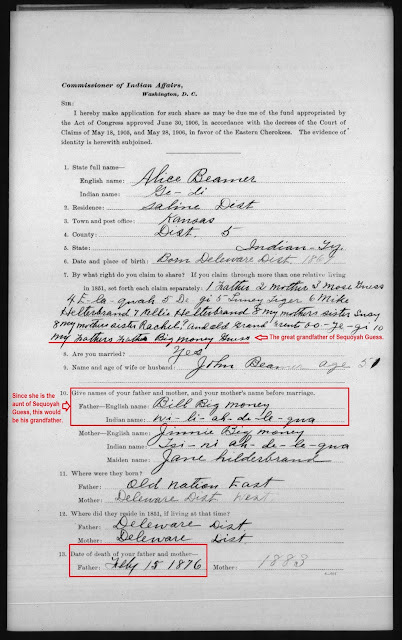 All the documentation found supported that determination, including the Eastern Cherokee Application filed for Sequoyah (17322) by his aunt, Alice Beamer. 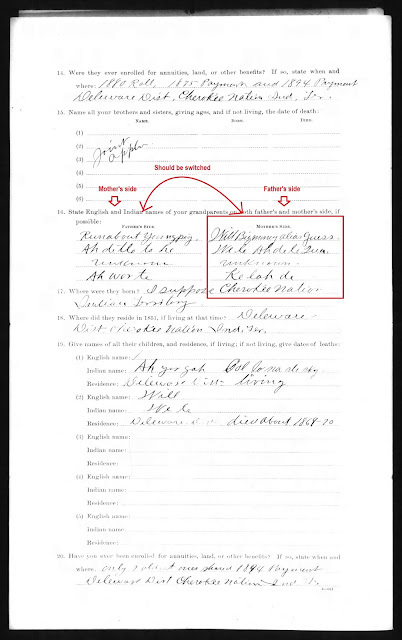 Though the application listed his English name as Tom Guess, his Indian name was listed as Sequoyah. 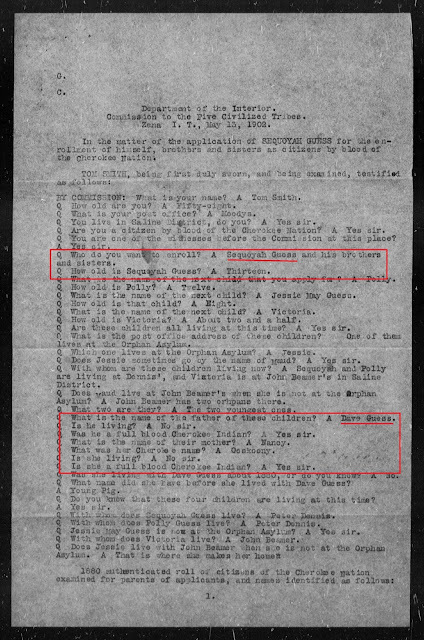 His parents were listed as Dave Guess and Oo sgoo ne, which matched the names given for his parents in his Dawes application. 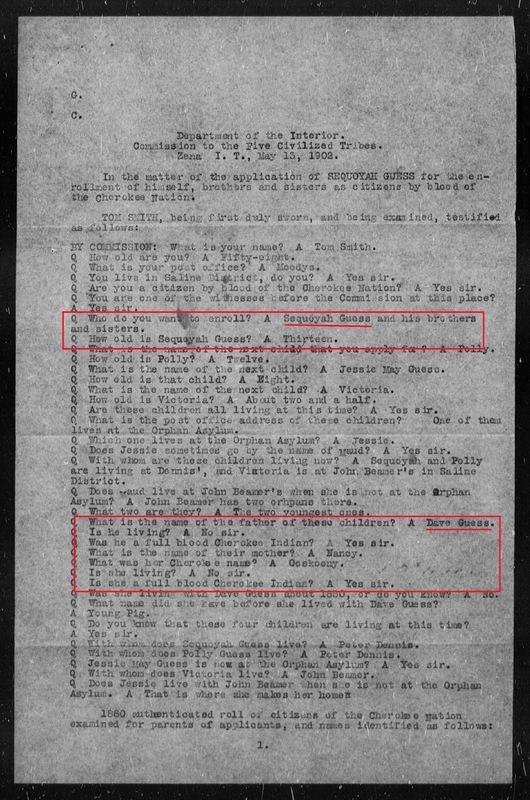 The second page of Sequoyah's Eastern Cherokee application listed the names of his grandparents. 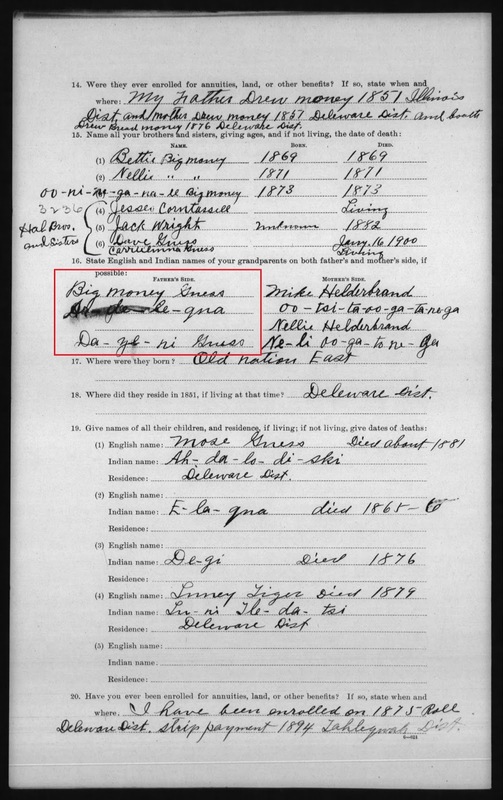 While written in the opposite sections, his grandfathers were listed as Will Bigmoney aka Guess and Runabout Youngpig. Because Alice Beamer was Sequoyah's paternal aunt, her paternal grandparents were Sequoyah's paternal great-grandparents. 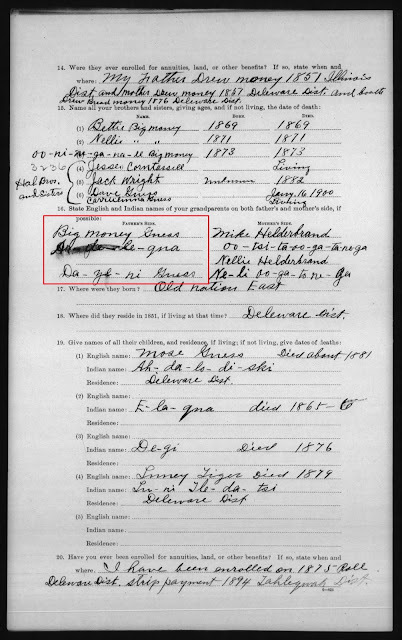 On the first page of her Eastern Cherokee application (8045), Alice reported that her father was Bill Big Money and that his father (described as her father's father) was Big Money Guess. 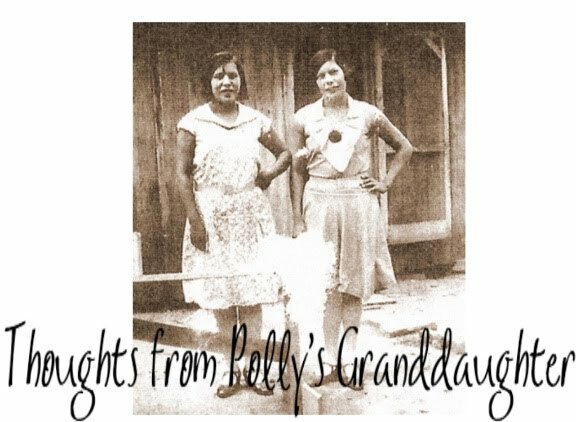 All those names are important in the next installment of this series where we will explore the older Cherokee records, including some from the pre-removal era. This will be a great opportunity to learn about the variety of records available on Cherokees during that time period. Wado for what has to be exhaustive research, Twila. The use of primary docs for accuracy should be noted by others who attempt to research Cherokee families. 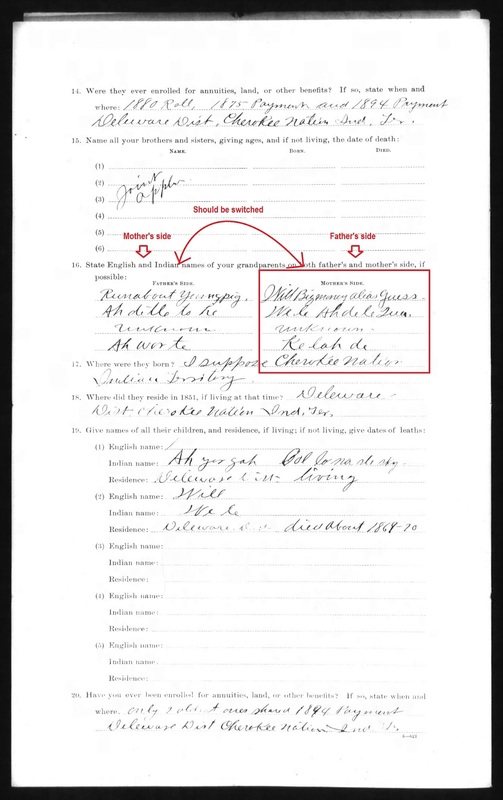 One cannot use information "borrowed" from sites such as ancestry dot com or old books and expect accurate results. Looking forward to the next blog! Excellent presentation. Looking forward to next installment. Hope the self-identified genealogist who mistakenly posted that Winnie Guess Perdue didn't descend from Sequoyah is reading this. She may learn something.